The What: The Tely 200 is an enterprise-class video collaboration endpoint designed for huddle spaces and optimized for the cloud-based video service of your choice. It will be demonstrated at the company’s InfoComm booth, N3047. 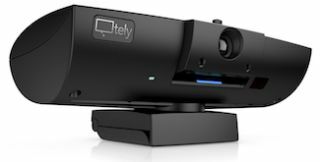 The What Else: Tely 200 is designed to seamlessly integrate with the cloud-based video service of your choice within minutes of opening the box, offers one-click meeting initiation from the integrated calendar, and instant access to virtual rooms via directory.